The situation that is developing around both this year’s Israeli election and next year’s ballot in the United States smacks of something like a developing conspiracy to renew the mandates of both Benjamin Netanyahu and Donald Trump somewhat reminiscent of the October Surprise that helped bring Ronald Reagan to the White House. Back then, the Reagan campaign team led by William Casey secretly negotiated with Iranian representatives to prolong the U.S. Embassy hostage crisis past the 1980 election, enabling Reagan to use the continuing stand-off as a wedge issue to attack the “weakness” of Carter foreign policy. If Carter had been able to bring the hostages home, he might have won reelection. In exchange for a Reagan offer of considerable military hardware, the Iranians agreed to release the U.S. hostages after the new president took office, which they did. And Reagan provided the hardware in an exchange that eventually morphed into Iran-Contra. What is less known is that the initial secret meetings between Casey and the Iranians were set up by a group of CIA Chiefs of Station who had served in the Middle East but were at that time in Europe. The first meetings were in Paris. The Chiefs, all active-duty, serving CIA officers, were working for the Carter administration but were conspiring to defeat him and contributed materially to that outcome. Several of them were rewarded when Casey was subsequently named Director of Central Intelligence. Curiously, both then and now Iran was and is at the center of what might or might not develop and there are clear signs that the United States is escalating its crisis with Tehran artificially to produce a conflict that would benefit no one in the short term but Bibi Netanyahu, Israel’s Prime Minister, who is struggling to get re-elected. A critical question becomes “Since Trump has pledged disengagement in the Middle East, is it he who is pulling the strings or is it National Security Advisor John Bolton and Secretary of State Mike Pompeo, somewhat reminiscent of the cabal of CIA Chiefs conspiring behind the back of the elected president in 1980?” But the more important question is, perhaps, whether Bolton and Pompeo actually want Trump reelected or might they be engaged in something even more devious? Is a Mitt or a Marco lurking, either of whom would be seen very favorably by Israel and the neocons versus an extremely narcissistic and ultimately unreliable Trump? That Washington has been slowly tightening the screws on Iran is undeniable, starting with the withdrawal from the Joint Comprehensive Plan of Action (JCPOA) nuclear agreement last year, which has led to a level of economic warfare initiated by Washington that is unprecedented between two countries that are not actually at war. Ironically and inevitably, though the suffering of the Iranian people is real, the elites who run the country are largely immune to the hardships being experienced. As there has been no sign that the Iranian people will overthrow their government, which is the White House’s stated objective, more pressure is being contemplated. 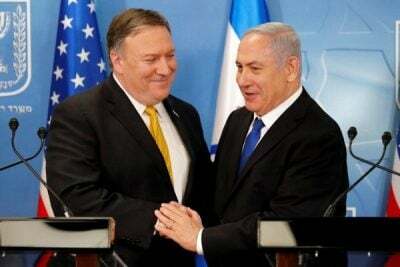 New sanctions were initiated last Friday and a move that mighty actually bring about an armed confrontation is being considered by Secretary of State Mike Pompeo, who is clearly favoring declaring the Iranian Revolutionary Guards (IRGC) to be a foreign terrorist group. Qassim Suleimani, commander of the IRGC’s elite Quds Force component, has already been designated a terrorist by the U.S., but no armed forces entity from any country has ever before been awarded that distinction and it would likely produce a serious response from Iran, possibly including an attack on some U.S. military installation in the Middle East or against a U.S. Navy warship patrolling the Straits of Hormuz. That would in turn justify a response and the crisis could easily escalate. According to the New York Times, the Pompeo “…plans also would designate some Iraqi Shiite militias as foreign terrorist organizations. As a result, the Iranian-trained militias — and Iraqi officials who support them — would be subject to new economic sanctions and travel restrictions.” This scenario would also compound problems with Baghdad, which is already reluctant to accept the stationing of U.S. troops in the country without placing severe restrictions on when, how and where they might be able to operate, and it would also be seen by the rulers in Tehran as a major threat to Iran’s national security. So, there would be complications and also considerable downside if Washington were to take the lead on designating Iranian or Iranian connected militias terrorists, but bear in mind the considerable upside, which is that war is, generally speaking, good for incumbency unless it quickly and undeniably goes disastrously wrong. A quick strike to punish Iran before the Israeli election would help Netanyahu, just as a successful and not too prolonged “cakewalk” engagement with the Mullahs would elevate Trump next year. The president and his close advisors have surely noted that the only time he was regarded as “presidential” by the media and inside the Beltway talking heads was when he ordered the launch of cruise missiles to punish Syria for an alleged chemical attack back in April 2017. The fact that the attack was based on false intelligence was irrelevant and it did not produce any damage to key voter constituencies, apart from that segment of the population that voted for Trump because he was perceived to be the anti-war choice for president. The Israelis are, of course, deep into the planning for a conflict, and have recently again been promoting their repeatedly discredited casus belli claim that Iran has a secret nuclear program. It would be reasonable to suggest that war with Iran is coming and it is only a matter of timing concerning when and exactly how it starts. There may not be enough time left to do Netanyahu a favor that he would surely reciprocate in American elections next year, but you can also bet that the Israeli Mossad intelligence service is hard at work coming up with “false flag” contingency plans to jump start a war sooner rather than later. There have long been concerns that intelligence agencies might go rogue but we are now living in an age where the existence of a “deep state” in many countries suggests that they have already been rogue for some time, most particularly in the United States. Suggesting the possibility of some covert intrigues behind the scenes in the Administration does not necessarily mean that there is an actual conspiracy apart from that which is being run by the White House and Congress against the American people. But because we live in a world where we can no longer expect the government to behave honorably, it is wise to expect just about anything. Politicians care only about retaining power by being re-elected in both Israel and in the United States and, since the two governments are currently joined at the hip and likely perceiving war as part of an electoral strategy, why not expect the worst? Philip M. Giraldi, Ph.D., is Executive Director of the Council for the National Interest, a 501(c)3 tax deductible educational foundation that seeks a more interests-based U.S. foreign policy in the Middle East. Website is councilforthenationalinterest.org, address is P.O. Box 2157, Purcellville VA 20134 and its email is [email protected]. He is a frequent contributor to Global Research.